This set is quite cool. It’s a double disc set of the classic Jethro Tull album. The first disc features an all new stereo mix of the main album, while the second disc includes a lot of material from the 1970-1971 period, many of it unreleased. I think that the central disc sounds great here. The booklet that comes with is great, and overall the packaging really scores a big win. All in all, this is highly recommended. I have already reviewed all the tracks of the main album before, on my review of the original edition, so those track by track reviews (since the only difference is the mix) are included here for the sake of consistency. The familiar hard rock riff leads this off and we’re on our way with a crunchy jam. Certainly this is one of those songs that just about everyone reading this have heard. It drops back to a mellower section and this might not be the most proggy thing we’ve ever heard from Tull, but as they build it back up there is definite prog rock in the midst. The fast paced, but more melodic jam that takes it after this is great, too. This song (and indeed the whole album) has established itself as a real classic and despite the oversaturation still holds up quite well. There is a killer guitar solo later in the piece. It drops back beyond that to another balladic take before powering back out into the song proper. Flute starts off and leads this into a cool prog rock jam. They take it out from there into a harder edged jam and I swear there’s a bit of “Day Tripper” in the music to this song. This is a more proggy cut than the opener. It’s also a great piece of music. They take us through a number of cool changes and alterations in this great journey. Here we get a balladic number based on guitar and voice. At less than a minute and a half in length, this is a short interlude. The mode is not all that different from the last track, except some other instruments are added to the mix. This is a more energized tune and it’s quite catchy. It gets fairly involved as it carries forward, though. There is still a definite 1960’s styled folk rock texture to a lot of this. Here we get another track that’s based on what is essentially a ballad approach. This gets quite involved and is one of the more purely prog rock journeys here. It’s also got a healthy dosage of 1960’s sounds. It’s another that clocks in at less than two minutes in length. Starting with soundbites that make me think of Pink Floyd, this moves out to a hard rock chord progression (in fact this is essentially the same riff as “Locomotive Breath” which comes later) this is played in a fairly mellow motif. It’s got a folky nature to it, yet still rocks out. They work through several killer segments and this is a less obvious highlight of the disc. I’m sure the lyrics to this one don’t sit well with a lot of religious people, but I think that they should really listen to them and think about the state of “religion” versus the love of God. This is a powerful track. It starts with a piano based balladic arrangement but screams out in a crunch guitar driven section later. This has always been a favorite of mine and it holds up every bit as well today. There are some intense musical moments and while this is perhaps less diverse than some other Tull music it’s every bit as poignant. We get a cool flute solo, too. They take it through a few alterations and variations on the central theme. At over seven minutes in length this is the longest cut on show. We find that “Locomotive Breath” riff here, as well. It’s a chugging little guitar bit that’s alternated with a gospel kind of jam. There’s also a cool rock and roll bit that reminds me a bit of The Beatles or George Harrison solo. This is another where the lyrics might give pause to some especially religious folks. Less than a minute and a half in length, this is a sedate little folk oriented ballad. It’s a good track and gets a bit involved with a rather symphonic arrangement. And here’s that riff we heard in a couple songs before in all its glory. A piano based jam sets the tone and after a while this powers out into some serious rock. This is another song that’s been all over the radio at times. We get an extremely tasty flute solo on this piece. This has always been another of my favorite cuts on the CD. It starts off with a mellow, rather folky jam. This holds it for a while, but after a time they power out into a crunchy hard rocking prog jam. There’s a real pop rock feeling to the chorus on this, but this is a serious rocker otherwise. It’s got some smoking hot flute soloing and a great guitar riff driving it. Here’s a short cut that’s pretty typical Jethro Tull in an acoustic ballad motif. This version of “My God” weighs in at over nine-minutes in length. Some of the familiar sections of the song are present here, but there are some alternate lyrics and a lot of changed music, too. It’s an intriguing cut. It doesn’t work as well as the final version, but I still like it quite a bit. This piece is previously unreleased. Another previously unreleased cut, this is a somewhat different version of the album tune. This version is pretty close to the final version, but the recording here feels a little rough. It’s another previously unreleased tune. The guitar solo is certainly different here, and I prefer the album version. This alternate rendition of the album cut is good. It doesn’t seem all that different. It’s another previously unreleased piece. A bouncing and fun acoustic tune, this is an intriguing number. It’s not as strong as the stuff on the album proper, but still pretty cool. It’s another previously unreleased tune. Another previously unreleased number, this has a real gentle texture to it. It’s a more complex arrangement of the album song. In a lot of ways it’s a completely different song because there are a lot of sections that must have wound up on the cutting room floor (figuratively, of course). It’s much more decidedly progressive rock. Here’s a classic Tull tune. It’s a pretty, intricate and quite progressive tune with a fairly complex arrangement. Here’s another version of the cut we heard earlier on this disc. Where the other version focused on an acoustic arrangement, a powerful, harder rocking mode serves this rendition well. This cut feels, more than the previous tune, like it would have fit on Aqualung pretty well. It’s a hard rocking Tull tune with the trademark drops down to acoustic motifs. I like this one a lot. Although this is quite a cool tune, this instrumental doesn’t really feel like Jethro Tull. It starts off like something Emerson Lake and Palmer might do, but then shifts out to music that’s quite fusion-oriented. It’s a very progressive rock leaning track with a lot of changes and alterations built into it. 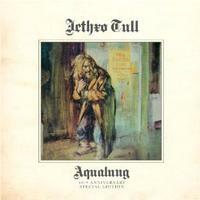 Here’s a short acoustic guitar based Jethro Tull ballad. We literally get a short Jethro Tull radio ad here.It includes samples of the music, Ian Anderson speaking and bits of announcer talking.